But it's the start of World War II, and America doesn't see it that way. Like many other Japanese Americans, Yuki and his family have been forced into an internment camp in the Utah desert. But Yuki isn't willing to sit back and accept this injustice -- it's his country too, and he's going to prove it by enlisting in the army to fight for the Allies. 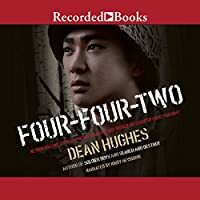 When Yuki and his friend Shig ship out, they aren't prepared for the experiences they'll encounter as members of the “Four-Four-Two,” a segregated regiment made up entirely of Japanese-American soldiers. Before Yuki returns home -- if he returns home -- he'll come face to face with persistent prejudices, grueling combat he never imagined, and friendships deeper than he knew possible.